A few months back, I hosted a bridal shower for my little sister. Pink was her favorite color growing up, and I thought it would be appropriate to go all out with the girliness and go crazy with pink. But, you know, in a classy and grown up way. I never got around to posting about the shower, but then I started seeing all these cute Valentine's Day things on Pinterest. I immediately thought of all the pretty pink from the shower and decided to dig out the centerpieces I made to decorate our table. So, I thought I'd finally share the tutorial I made for these super cheap, super easy centerpiece stands. They turned out even better than I'd thought they would. You'll need a drinking glass, a square ceramic tray, some epoxy or household cement, little rings (I used some jewelry parts - I think they're called jump rings) and spray paint. I got everything but the spray paint at the Dollar Store. You'll also need something to decorate with - I used a crystal garland. Start by squirting some of your epoxy onto the bottom of your glass. A nice big glob works well. Then put the glue side of the glass down on the bottom of the tray. Try to get it as close to centered as you can. Next, epoxy your rings upright onto each of the four corners. Then get some weight to press down on the glasses to make sure they really stick. I used paint cans. It was a little precarious with a toddler around, so I hid them in a closet shortly after this picture was taken. Let the glue fully cure - mine took 24 hours. Once the stands have dried, spray paint them. I went with white. It took a couple coats. They look much better all one color. I also put a clear coat on them at the end, just to be safe. Attach your crystal garland to the jump rings on each corner. There you have it! Cheap. Easy. And oh so pretty. I made some quick flower pomanders to sit on mine. I just picked up some styrofoam balls, cut a slice off one end so they'd sit flat, and stuck silk flowers into it until the styrofoam was completely covered. Alright, since I teased you with the worst bathroom renovation preview photo ever yesterday, I figured I'd make it up with some cuteness. And the cutest thing in my house is my two-year-old. Well...about half the time he's cute at least. The other half he's making snowballs in the toilet out of toilet paper. Or some other such thing. Here's one of the cutes, though. That right there is Cowboy Spaghetti, folks. You see, we live in the west. Hence the name of my blog, The Spaghetti Westerner. And when I say the west, I don't mean California. I mean the Wild West. In a town where cowboys and gold miners run amok. This time of year there's a great gathering of cowboy poets. One of the best advertisements for this event that I've ever seen asked, "What rhymes with varmint? Find out at Cowboy Poetry." Seriously, can you think of anything that rhymes with varmint? And so, the cowboys also invaded the library, bringing with them their poems, their tunes, and their particular brand of humor (you know the kind where a "ten-liter hat" is the punchline to a joke). 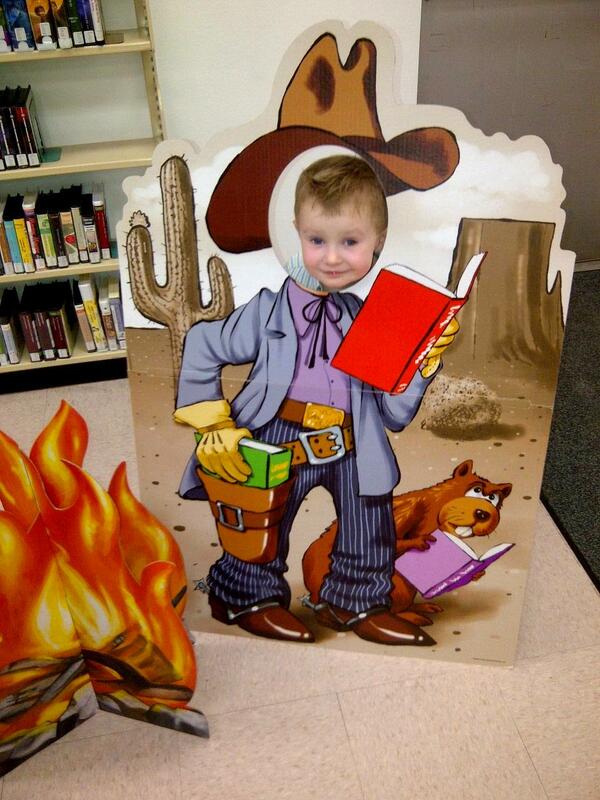 Little Spaghetti couldn't resist putting his head through the cut-out and becoming a cowboy himself. Where have I been? And a bathroom preview. I fell off the face of the earth! Or so it feels. We got sick (as I mentioned)...strep throat. And it was yucky. Then there was the little matter of having torn apart our bathroom. It feels like I've been doing nothing but working on that bathroom, day in and day out. Minus the weekend we went out of town to go to the spa and get massages. But I wouldn't want you thinking I have any fun around here, so I'll just blame the bathroom. Any who....the bathroom is so close to finished. I mean so very, very close. Sure, there's no toilet. And no sink. No mirror. No toilet paper roll. No shower head. No faucet. No drain. No door. But we are so very, very close. It will be done by Friday. It has to be done by Friday so that my in-laws can come visit. And I'm guessing they won't appreciate a bathroom without a door. Yeah, I know. That's the world's worst preview. It's not really even a preview. But it is our list. Or as my engineer husband labels it, it's our "Sequence and Materials: Hall Bath." See how many things are crossed off the list? A lot. That's how you know we're getting close. So very, very close. And I cannot wait to be done. Do I sound anxious? I am. You know, just a little.